Heat butter in a non-stick kadai. Crush ginger, cut garlic pod horizontally, and add both to the butter. Add onion, and sauté for 2-3 minutes. Then Add refined flour and sauté for 2 minutes. Add salt, black pepper powder and garam masala powder and mix well. When the mixture comes to a boil, add spinach puree, and cook for 10-12 minutes. Remove the chicken breast and keep aside. Strain the soup into a bowl. Cut the chicken breast into small cubes and add to the soup. Garnish with 1 garlic clove taken from the residue after straining the soup. Sprinkle some black pepper powder and serve hot. Heat ½ tsp of olive oil in a non-stick pan. Add the broccoli florets and stalks. Sauté for a few minutes. 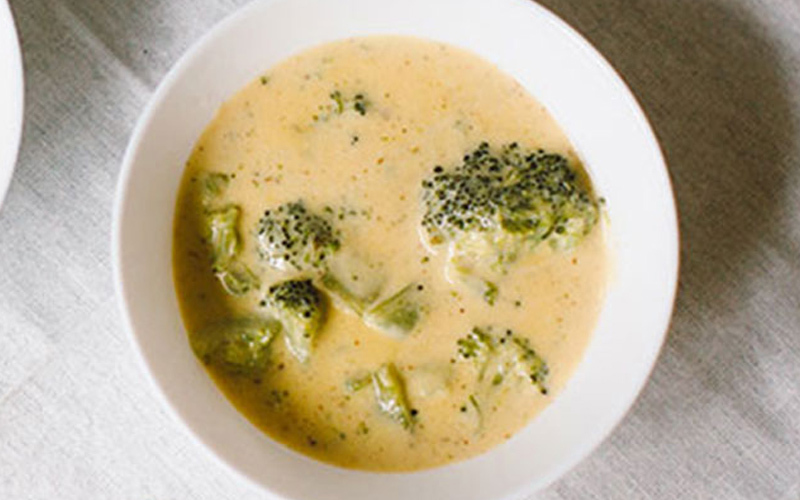 Purée the broccoli in a blender with half cup of water. Keep aside. Melt the remaining oil in the same pan on a low flame. Add the flour and sauté for a minute, making sure it does not burn. Add the milk, mix well and bring to the boil. Simmer for 5 minutes. Add the nutmeg powder salt, pepper and broccoli purée along with 3 cups of water and simmer for a while.